8 Free Woodworking Plans found in the "Bird Houses" Category. Yes, I understand the difference between a bird and a bat, but a bat does have wings and it flies, so it's a very appropriate place for a free bat house woodworking plan. The plan has all of the information that you need to construct this project: simple diagram, parts list, and clear directions. Did you know that according to the EPA (provider of this free plan) many bats are becoming endangered due to dwindling areas that they can roost and pesticides. Also according the the plan, you should locate your newly constructed bat house where it would get early morning sun, but protected from the mid-day heat. Brought to you by the Environmental Protection Agency. The unique thing about this free woodworking plan is that (1) is paid for by our taxes. (2) It covers multiple types of birds and (3)it's guaranteed to attract the type of bird you want. Ok, three is not true, but this is an excellent resource for building all types of bird houses. "Go Green"...build this free woodworking plan. Teachers and Cub Scout Leaders take note: This is the woodworking plan for you! If you have a ton of bird houses to construct or a bunch of kids to pacify for an hour or so, check out this plan for a simple to build, easy to create, and quick to prepare Bluebird bird house. This might also be a good project plan if you wanted to decorate a path or road. Build ten of these bird houses and mount them on trees evenly spaced. Anyway, I'm sure you'll find a good use for this plan. It comes with simple diagrams, a material list, and even a tools list needed to build this plan. To top it off, they even give you the measurements for where to pre-drill for the when the toddlers nail this project together. Ok, the title on this plan is a bit trite (Home Tweet Home), but it's cute. This is another fine woodworking plan from the makers of the Shopsmith. Inside, you will get a plan for two bird houses (Blue jay and Wren). As always, they supply a complete material list with step by step instructions. For the beginner Ornithologist, they have a section on tips related to bird houses and the important things to consider during the design and build. Like must of their projects, they give you a PDF formatted plan for easy printing. I know that this is not related to the topic of woodworking, but I looked up the word Ornithologist on wikipedia and it's simple a list of the worlds Ornithologist. It's funny that all of them would fit on one page. There must not be a lot of them. Where does one study Zoology anyway? This is a great woodworking project for the beginner or even the experienced woodworker to build with the kids or grand kids. As the title states, it's a very simple plan, but the website has absolutely every thing you need to build this project. The have very detailed drawings with a material list. Many of the steps are documented with actually pictures taken during the build. The only thing I would suggest is that you swap the wood they use for cedar. Doing so will make this bird feeder last forever. The birds will love you for it and so will your family when they see the final result. 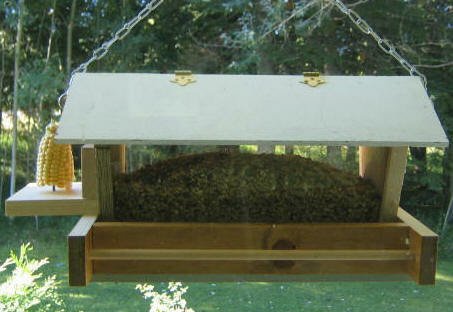 A smiple starter project if you need a basic bird house in the yard.